I know it is only January and we are likely to get blizzards and frosty mornings for at least another 2 months, but this weekend has been filled with the promise of things to come. The sun has shone and the birds are singing. 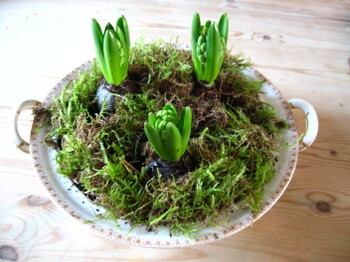 Bulbs are popping up and my lawn is filled with crocuses (I didn't take a picture as it is also filled with holes where Bodie had a go at digging them up!). I did take a picture of these though. I love the smell when they open up, and it always reminds me of my Grandma. I am sat here by the fire with a glass of wine (having completed the biggest pile of ironing I've ever seen), while the girls are diligently tidying their bedrooms and Andy is in the kitchen cooking Pheasant with Chorizo and Butter Beans from yesterday's Guardian. Bliss. Actually the girls are arguing over who is most responsible for the mess, and if they spent as much time tidying as they have bickering the whole house would be immaculate, but that's just a small point! Other than that it is bliss! I am still loving my new job, and will be really sad when the woman I am covering for comes back. I lost 3lbs in the first week, and could do with her staying off until I have lost 2 stone, but that may take a while! I am really feeling a sense of achievement and purpose at the end of every day and I am surprising myself at how organised I am. I am not usually very organised and life tends to be a bit chaotic and haphazard, but I do generally like that way of living. I am enjoying the structure now though and knowing what is happening when. The house is a bit of a pickle and I am missing popping into town for coffee with friends or time in my sewing room, but it is a small price to pay and I am having to go to the pub in the evening with friends instead! Shame! I went too a car boot this morning with my friend Sophie (who wasn't put off by our last visit, which was her first ever). It was quite disappointing today though as there were almost too many sellers and we lost the will to live about half way round. Some of the things I liked were hugely expensive too - including a small tin of buttons and sewing bits and bobs for £10 I bought one twice the size filled with masses of stuff for £2 a few weeks ago, so I left it there. I did get a few treasures, but not my usual stash, but we had fun nevertheless. 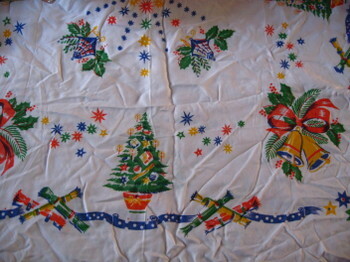 I know I am excited about Spring, but this tablecloth was too good to pass up, especially at 20p! One for Grace - our very own naturalist (or naturist as she said she wanted to be when she grows up! I think she meant naturalist). 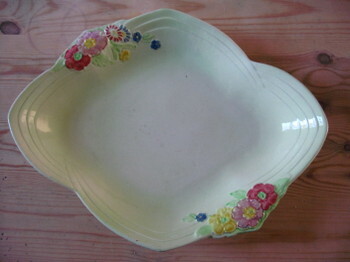 You can't tell from my awful picture, but this dish is a really pretty shade of green, and I love the shape of it. 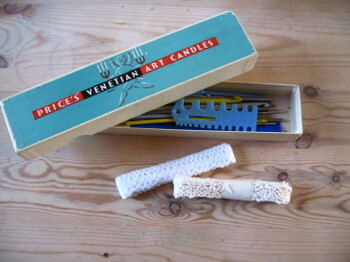 I also picked up some linens and a cut glass candlestick. So, not a total disaster. 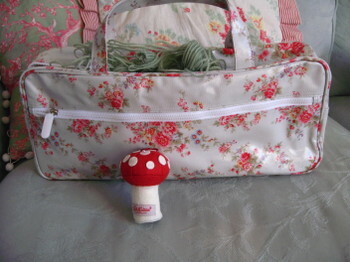 I came home from work on Friday to find a parcel from Cath Kidston on my doorstep containing a toadstool pincushion. I was rather surprised, as I hadn't ordered it, but it turns out it was part of my Christmas present from my Aunt, which was delayed in the post. It goes with my lovely knitting bag which arrived before Christmas, and is now keeping my current project safe (an iPod cover in the green wool you can see popping out of the top). It is taking a while as I am too tired in the evenings and am not quite at the stage where I can do it whilst watching TV! I will get there in the end though! 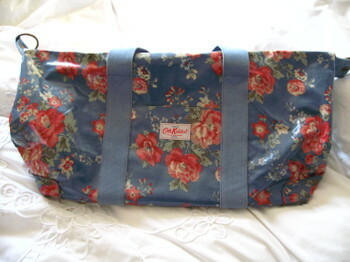 I seem to be having a bit of a rush on Cath Kidston stuff at the moment. Aside from the knitting bag I also received this enormous travel bag from my parents, which I am looking forward to using when we go on holiday to Northumberland in 3 weeks time. My sister gave me some toiletries also for Christmas, and I treated myself to this writing set as I love writing letters, despite the advent of email, and nice writing paper is hard to come by. 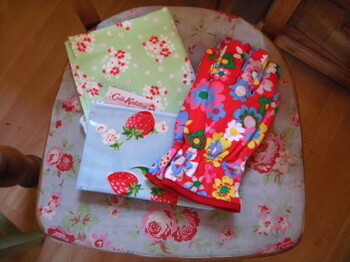 My lovely friend Sophie went to the Cath Kidston outlet at Bicester a week or so ago, and brought these delights back for me too, so I have been well and truly spoilt. I feel guilty about liking CK stuff as I do think it is overpriced, and I do generally prefer things that are genuinely old, but I just can't help it. She does do things that are out of the ordinary, and the colours are bright and cheerful. Now we have a shop here in Cheltenham it is much more visible though, and she does seem to be taking over the world! I do like my gardening gloves, and they look good hanging by the back door ready for action! Well, again I must apologise for not checking out your blogs. I know Jess at Lobster and Swan tagged me and I am trying (and failing) to think of 7 things that you don't know about me, but I will save that for another time. I have got over 500 entries to check out on Bloglines, and I feel bad for not replying to all your lovely comments, but blogging is one of the things to fall by the wayside at the moment. I promise that when this job ends (maybe at half term) I will leave long, thought-provoking messages on each and every one of your blogs! I also haven't forgotten about the pay it forward, but again it has been put on the back burner for a while. Sorry. Please forgive me and stick with me - as some bloke said in some film "I'll be back"! Just thought I'd say a quick hello. I haven't had time or energy for photos and anything creative, but I wanted to thank you all for your kind messages. I am having a ball at school and will be very sad when it comes to an end (it is probably only for this half term). The girls are really enjoying going to school early and helping sharpen the pencils, and keep being sent to my classroom by their teachers to show me work they've done. They are so enthusiastic and helpful, especially Grace who is dressed by 7.45 every morning and gives us a running commentary of how many minutes we have left until we need to leave the house. I am popping home for 15 minutes at lunchtime to feed Bodie and let him out, so it is just as well I only live a few minutes from the school. The children in the class are all lovely (it is hard to find an unlovely 4 or 5 year old), and I feel I have made a good start to the job. No one has been sick, although several have fallen over, and I have even coped single handedly with 2 wet play lunchtimes. I am coming home every day feeling tired but happy, and I am even managing to keep the girls fed and clothed. I was in bed and asleep by 9.30 on Friday though! Hope you are all having a good week. Sorry I haven't made it to your blogs this weekend to catch up on you all, but will try to fit it in one night this week. Good evening everyone. I hope you have all had a lovely restful weekend after all of the excesses of the last few weeks. I am in a mild panic about starting work properly tomorrow, so I thought I'd blog to take my mind off it! I shadowed the reception class TA on Friday and she is very organised and in control, but I think I will have to put my own (badly organised and not at all in control) stamp on the job for the next few weeks. I have been volunteering in the class for 1 day a week for the last 3 years so it isn't a total learning curve, but it will be a shock to the system. The most important thing is that I have established where the sick bags are and the nearest path to the sink just in case any of the little darlings come down with this terrible D&V bug that is shutting down the country. I have actually had quite a productive weekend for once. Andy and Bodie went to help out with our friend Greg's night orienteering competition in the Forest of Dean, and was away all day, and the girls spent hours playing upstairs with their new toys - only popping down occasionally for refreshments, which meant that I could take down the Christmas tree and have a good clean through. I love putting the decorations up, but as soon as New Year is over I can't wait to get them down again. The house looked so tidy, and once the girls were in bed I sat in front of the fire just looking at how calm and relaxing it was. Just as well really. They've all been at home today so it is trashed again now, but it was nice while it lasted. Sophie and I went to a car boot sale this morning, and it was Sophie's first ever visit to one. I think she will be back, although we have very different tastes and she was fairly tickled by some of my purchases...particularly this one. 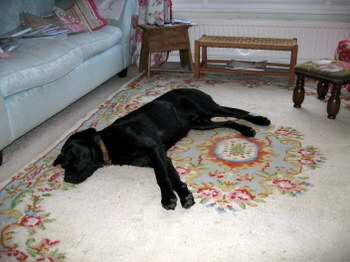 I have been after a rug for our sitting room for ages, but they all seem too heavy, or the wrong colour, or too oriental in style. This one however was perfect. The duck egg blue matches the sofa and the red and green match the chair and curtains. The fact that it was £4 also helped me make up my mind! The fact that it is a little grubby and threadbare only adds to the charm in my opinion. Andy let out a huge sigh when I came home, but knows better than to get involved! As you can see, at least Bodie has taken to it. 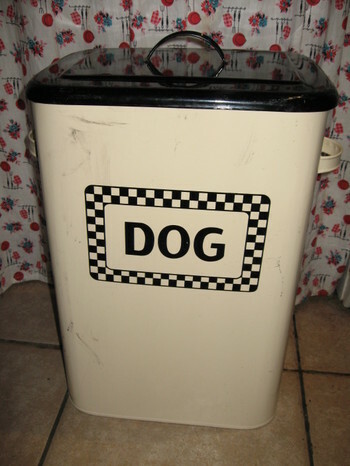 I also got a powder blue enamel saucepan (which I forgot to take a photo of) and a huge cream enamel bin with 'Dog' on the front which is perfect for Bodie's dog food (once it has been cleaned!). 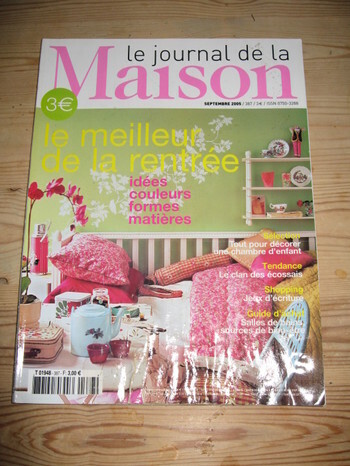 A very kind lady gave me this magazine as she didn't have any change and I only had a £5 note. 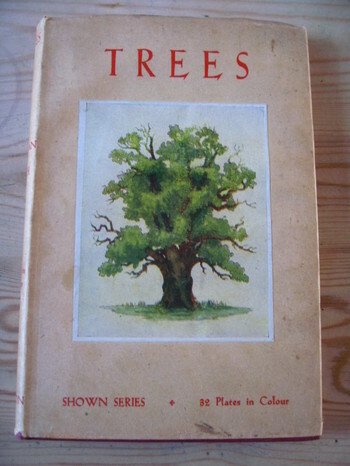 I love the picture on the front, and I am looking forward to reading it later. 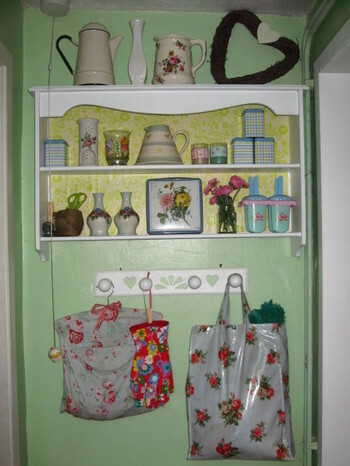 I also topped up my growing collection of vintage treasures for my website. Andy spent a happy afternoon playing with the pop up light tent, and took some great photos for me, and I have just created a new Vintage category on my website and uploaded some of the bits and bobs. 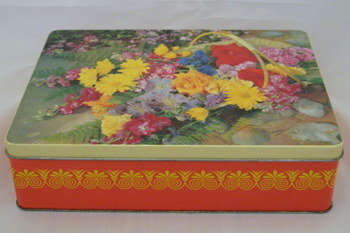 There are some tins, and some glass and china items. I have heaps more to do, and this is just a start, but please tell me what you think (and feel free to order too!). I just wanted to get a few new things on there as I am going to struggle to do much else new for the next few weeks. My website link is in the sidebar on the left. Alternatively, click here. Don't forget that all UK orders get free P&P. Damn, I have just realised I have missed Sense and Sensibility. I can always catch it on replay, but I like the thought of snuggling up on a Sunday night with a period drama and a cuppa under the blanket. I did enjoy it last week, but I have a real soft spot for the Emma Thompson film version (despite having her in it) - not least because my Aunt sang the soundtrack. Did any of you watch Oliver Twist? I was so disappointed that it was on every night - there was no chance I could catch every episode over Christmas. Sunday night is the rightful place for period drama! Well, I'd better go and get clothes ready for tomorrow and plan the week's meals. Wish me luck for tomorrow (well actually, wish it for my 2 poor, soon to be neglected children, and the 29 children in Reception!). Thank you all for your Happy New Year messages and words of encouragement - you are a lovely bunch! I hope you all had a lovely festive season. I can't believe after all that planning and anticipation that it is all finished. 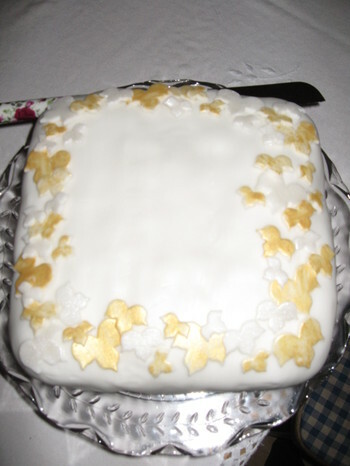 I did enjoy the planning, preparation and cooking, and spent a happy hour or two decorating my cake on Christmas Eve. We had such a lovely time. Christmas was spent here with Andy's parents, and then the day after they left we went to stay with my parents near Loughborough. My sister was there for part of it, but then left on New Years Eve for a romantic evening with her boyfriend (oh to be at that stage of a relationship! ), and my Aunt, Uncle and cousin were over from Australia. We spent New Years Eve with them, my Grandma and some family friends and had a really great evening. Every year I promise that I am not going to start crying as Jools Holland counts down to midnight, but every year I fail and sob like a baby! My mum does it too - I'm a chip of the old block. On New Years Day we went for a lovely but very muddy walk with my parents and some friends, and then went to the most amazing pub for lunch. We came home yesterday evening, so today is going to be spent finding homes for all our new toys, and ironing! The girls went back to school today, and for the first time ever I had to wake Grace up. She is a really early riser normally but today she was buried under her duvet snoring at 8.00! To stay on top of the washing at all times! There are many more, but the ones above are the ones I wanted to publish so that I have even more of an incentive to crack on with them! I may not be blogging much for the next few weeks as I have got myself a job. As from tomorrow I will be working full time as a teaching assistant in the Reception class I currently help out in while the usual assistant has an operation. It could be for 6-8 weeks, and I can't wait. I have been thinking for a while about becoming a TA as I can't quite face the thought of doing a PGCE and becoming a teacher just yet. I am slightly worried that the girls may not get fed or clothed, and I have no idea how I will cope with full time - it is 8 years since I worked more than 2 days a week. Therefore blogging, crafting and my website will be taking a back seat for a few weeks. I will be back in proper operation after half term, all being well. 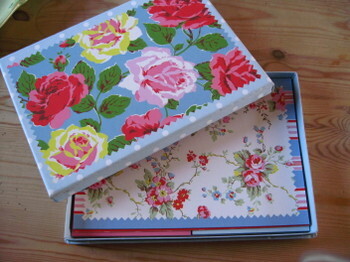 I had some lovely gifts, and will try to take photos to show you at the weekend. The girls had the Playmobil Victorian Mansion for Christmas - it used to belong to my best friend's children who are now well in their teens, but every bit looks brand new. Even the hundreds of flowers in the window boxes are all still there. Grace and Ruth have spent hours with it already, and I had great fun setting it all up on Christmas Eve. I just need to find somewhere to put it as it is in the middle of our dining table at the mo, and makes eating a bit of a struggle! 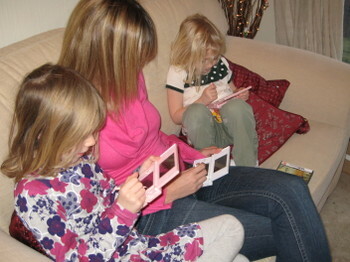 I'll leave you with a picture of my sister and my children with their other new toys! I'll be checking up on you all soon, but please don't be offended if it isn't as often. I'll be back to normal soon!